Stock market watchers like myself have had an entertaining couple of weeks recently. Amid lots of dramatic economic and political news, the S&P 500 index has dropped from a July level of 1356 down to 1199 (as of Friday August 5th). This 157-point drop works out to almost 12 percent of the value of the index. For those of us index investors who don’t care about short-term factors, and who know that in the long run, buying at a low price-to-earnings ratio is the only real way to increase your odds of higher long-term returns, this means stocks are 12% more attractive this week than they were on July 22nd. If you think of the stock market as a machine that hopefully delivers 9-10% annual returns to you before inflation, this is like getting an extra 1.2 YEARS of investment gains added to your return. So is it a good time to invest? In an earlier article called “How to tell when the Stock Market is on Sale“, I suggested that stocks in an S&P index fund start to become a good deal when the price-to-earnings ratio is below 16.4, the long-term average for US stocks if you start your counting at the year 1881. (Note that this is the conservative way to measure, since the average P/E ratio since 1950 is more like 18.6, and some market optimists start their own counting in the 1970s or even 1990s). When I wrote that article, the S&P500 index was at 1280, and the total company earnings for the most recent year were $78.86, giving a ratio of 16.23 – right around the average. Now the index is 1199, and the earnings have grown to $82.13. Because despite what you read in the complainy news headlines, the US economy is quite healthy overall and many companies are raking in record profits. The new P/E ratio is therefore 14.6! More conservative investors like Robert Shiller, author of Irrational Exuberance will tell you that looking at just the current year’s P/E ratio is naive – you should look at a ten year rolling average of earnings to see how the stocks are really doing. In that case, even with the sale, we are still at a ratio of 20.7. This method would tell you stocks are still expensive – 26% overvalued. On the other hand, while they are higher than the historical average since 1881, stocks are still cheaper than they have been for the last 18 years or so (except for a couple of months right around the Great Financial Crisis of 2008). So, I’ll leave it up to you to make your own investment decisions. But for my part, I’m currently re-buying the shares I sold off earlier this year to kill off the mortgage, at a 12% discount. And I’ll continue to add to the stash over time if the panic and reduced share prices persist. To make money in stocks you must buy low, benefit from a reasonable dividend yield, and hopefully eventually sell high as well. This feat is made much easier if you can manage to buy during periods of great turmoil and scary news headlines – i.e., when stocks are on sale. Update! I wrote that on the weekend in case people wanted to start thinking about picking up some stocks this week. Then on Monday the S&P Index dropped another 6.66%. So the total discount is more like 18% now. Apparently this is one of the top 20 drops of all time (you need to get to the 2008 level of over 40% to get into the top ten, since the 1900-1949 period was loaded with megacrashes). I clicked ‘buy’ on Monday afternoon with all of the spare vacation earnings in my bank account. 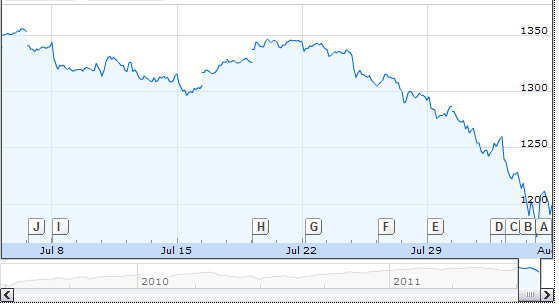 Perhaps I’ll go out and earn some money this week so I can buy more shares if the rout continues. Previous Post: Making Money while Taking Vacations Next Post: Reader Case Study: Is this 26-year-old Ready to Retire? Very timely post! I have been watching the S&P 500 P/E 10 and P/E ratio since your original post of stock markets being on sale, with special interest this last week. I guess I am more conservative – I want to see if somehow the P/E 10 ratio drops down to below 16.4 in the next few days. But you bring up a lot of good points: that the average for the last 61 years is 18.6, rather than 16.4. Either way, I think I might use this turmoil as an opportunity to finish my Roth IRA payments for the year (have been doing regular payments up to now). Even if it goes lower, I’m not looking to cash out on them for many, many more years. The government offers to allow Roth conversions to take place at a discount from the marginal rate (you can convert this year for 15%… same as we probably would have taxed you based on lower income in retirement). This causes a tsunami of conversions and a tsunami of increased tax revenue. Seems this option might be palatable to both Republicans and Democrats (as it allows us to delay the pain). It may even make some sense since 2007 was the first year that births exceeded peak baby boom year… all those births (eventual workers) could pay for entitlements once we get past baby boom bubble. Wow, that’s a really interesting concept. I’ll be honest, I had to google “Roth conversions” to understand the idea, so take my word with a grain of salt :-). Now I’m wondering if you could roll over a 401k into a Roth 401k or Roth IRA when the stock market is down? I’m guessing it can only be done if you leave your place of employment, turn 59 1/2. etc etc. I’m not sure you can convert 401k to roth 401k (I think it’s just for IRAs)… but maybe not for long (since the government is hurting for cash). Maybe they are waiting to do this until rates on treasuries start going higher (so they can call the treasuries back in below par e.g. retire a trillion in debt for a mere 900 billion). We can all hope they have some sort of plan… but I wouldn’t be surprised if they didn’t! Yes, remember the rule change last year where anyone can now convert a Roth? It used to be your Adjusted Gross Income had to be under $100k to do so. In the words of renowned investor, Foghorn Leghorn, “I keep my feathers numbered for situations just like this”. If’n ya don’t buy low, it’s kinda hard to sell hi. I am amazed how low prices are right now. If I had some cash I would definately be putting it to use right now loading up on as much stock as I could be getting. Those taking advantage of the situation now will be sitting pretty a few months or possibly years from now. Unfortunately most people don’t think like this and are either selling or afraid to be buying with the market turmoil. My feeling is the U.S. economy is in worse shape than earnings indicate. However, my asset-allocation portfolio doesn’t care about how I feel, and that may be key to buying low and selling high (read: not lose money). I have equal target allocation to stocks and gold (amongst other assets), and with things going as they have I may need to rebalance soon – forcing me to sell gold (high) and buy stocks (low). Read a few articles here, and already found something that I love! Thanks for pointing me to http://www.multpl.com/! It’s so easy to use and find relevant info. Why is the media acting like the stock market going down is a BAD Thing? If you are near retirement, your money should not be in high risk. If you are not near retirement, than dang, you want the stock market prices to go down so that you are buying low. That is an excellent point. The very idea of wildly fluctuating stock prices every day seems more silly the older I get. We should care about the earnings and dividends of these companies, which are not changing every day. Imagine every farmer getting an appraisal on his farm once every few seconds, rather than concentrating on the amount of food the farm produces relative to its input costs.. then we write news headlines about the random fluctuations of these farm prices all day. It’s exactly the same thing! Even more silly are articles that spew out charting and technical analysis lingo. “Google is headed for the second shoulder of a head and shoulder formation – if it breaks the support at $300, the next support line is $100 down from there”. I had always assumed that there was something to this technical analysis, until I read A Random Walk Down Wall Street, which did statistical analysis on all of Charting’s Greatest Hits. The results: the predictions made by even the fanciest charting algorithms were no better than random guesses. Because the nature of stock prices is too random to predict in the short term. Why the S+P 500 Index fund, why not a value-weighted index fund like the kind espoused by Greenblatt in “The Big Secret for the Small Investor: A New Route to Long-Term Investment Success?” – BTW I don’t recommend the book as it is filled with already known information given you understand index funds and long term market kinetics. PLUS he has plenty of mindless personal nonsense in there that is not nearly as funny as yours. I like your suggestion too. I’m working on a reading list right now and one of the books on there will be Joel Greenblatt’s “The Little Book that Beats the Market”. One of my own index funds is the “VISVX” (Vanguard Value Index) fund which might meet your criteria. Interesting to look back and see how prolific this article was. Also interesting to see all of the sensational headlines made by the media to sell advertisements are long forgotten. Yeah, I was just thinking that (plus prolific > prophetic). If somebody had listened to MMM and invested $11788 in an index fund on 11-08-08, they’d be up to $17549 today… about a 22% annual return, before fees. Have you investigated looking for opportunities in other markets following this principle – or only the US? For example, you can buy an ETF on the NYSE that tracks Russia’s biggest companies, which has a PE of <5. I do like the other countries these days – Vanguard’s VGTSX is more interesting than ever, since it is cheaper than the US market on a P/E and dividend basis. You still get the same diversification and low fees, as with all Vanguard funds. As a fairly new reader of just a few weeks, I am catching up on the older posts. This one stuck out of the crowd. I know MMM would never claim prophetic power, nor advise trying to time the market, but WOW! With the benefit of 20/20 hindsight I can see that he caught the bottom here. 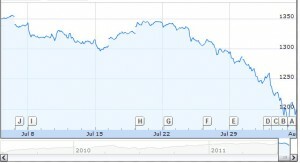 After summer of 2011, the S&P went on a tear, nearly doubling in 3 years, closing above 2000 in the summer of 2014. Maybe it is just good fundamental wisdom, tied to an attitude of “Don’t panic and don’t follow crowds.” Whatever, I like this blog and I intend to read on. So what now, with a Shiller PE Ratio of around 27, which is close to some other all time peaks? Would anyone suggest that you put all your savings in an Index fund? Is there not a point, where it is much more likely that sooner or later the S & P will take a dive again way below the 27 mark? I do agree to a point with all the “one can’ t time the market” statements, I’d just think right now the likelihood that this is a good idea to invest in index funds is just so much lower. Even Shiller himself took his money out of US shares . You could spread your money against all world markets, not just the US and then you’ve got some cover against a drop in the S&P. I do know what you mean though, with prices looking reletively high you second guess following the standard wisdom. I think if you have a lump sum and are waiting for a good time to invest in stocks then it’s not the same as the market timing they preach about buying and selling all the time to try and beat the market…..but then you could be waiting for years and miss out on further gains.